Think museums in India are dull and boring? Visit this pick of popular old and dynamic new specialty museums to learn about everything from the Partition to the evolution of transport in India, and textiles to tribal heritage. The Mewar royal family have converted much of their Udiapur City Palace Complex into a world-class museum, and it's a remarkable place to immerse yourself in India's regal history and heritage. The museum is housed in a series of palaces, dating as far back as 1559, that you can walk through. Its exhibits include priceless royal memorabilia such as silverware, musical instruments, family photographs and portraits, artwork, and weapons. While you're there, visit these other Udaipur City Palace Complex attractions too. Opening Hours: 9.30 a.m. to 5.30 p.m daily. Tickets: 300 rupees for adults, 100 rupees for children. DakshinaChitra Museum, dedicated to south Indian culture, features a collection of 18 authentic historical houses from all over the region. Each one has been transported and reconstructed on the premises, and contains a contextual exhibition related to the lifestyle of the community that it belonged to. The museum opened in December 1996 and is a project of the Madras Craft Foundation. Crafts are promoted via activities and workshops for visitors. The museum also has a handicrafts shop. Location: East Coast Road, Muttukadu, Chengalpet district, near Chennai, Tamil Nadu. Next to MGM Dizee World. Tickets: 110 rupees for Indians. 250 rupees for foreigners. Discounts are offered for students. One of the must-visit attractions in Odisha's capital Bhubaneshwar, this exceptional new interactive museum opened in early 2018. It's spread over a massive 13 acres, and has four zones with eight galleries. These include galleries dedicated to terracotta work, traditional paintings, stone and wood carving, metal crafts, tribal crafts, and hand-looms. Other attractions are an outdoor amphitheater for cultural performances, children's play area, and souvenir shop. Free one-hour guided tours take place daily at 11 a.m. in English, plus Ekamra Walks conducts free guided walking tours every Sunday afternoon at 3.30 p.m. Free pottery workshops are also held every Sunday at 2 p.m. Location: Gandamunda, Pokhariput, Bhubaneshwar, Odisha. Opening Hours: 10 a.m. to 5 p.m., daily except Mondays. Tickets: 50 rupees for adults, 20 rupees for students. Children under 12 can enter for free. Four new museums were inaugurated in the Red Fort's refurbished British barracks in January 2019. The museum complex, known as Kranti Mandir, is a tribute to India's freedom fighters. It covers 160 years of Indian history including the First War of Independence in 1857, Subhas Chandra Bose’s Indian National Army, India’s participation in World War I, and the Jallianwala Bagh massacre. One of the museums, the Drishyakala Museum, is a collaboration with Delhi Art Gallery. It has 450 rare historical works of art such as paintings by Raja Ravi Varma, Amrita Sher-Gil, Rabindranath Tagore, Abaniindranath Tagore and Jamini Roy. Location: Red Fort, off Chandni Chowk, Old Delhi. Tickets: 30 rupees cash, or 21 rupees cashless for Indians. Foreigners pay 350 rupees, or 320 rupees cashless. This is additional to the cost of tickets for entering the Red Fort. This important museum is dedicated to Mahatma Gandhi (widely considered to be the Father of a Nation for his role in the independence movement). It's located in the building where he spent the last 144 days of his life and was assassinated on January 30, 1948. The room where he stayed has been preserved and contains a number of his personal belongings, including glasses and walking stick. Visitors can also see the place in the back garden where he was shot, now marked with a Martyr's Column. Other items on display include photos, paintings, sculptures, paintings, and inscriptions pertaining to Gandhi's life. Location: 5 Tees January Road (formerly Albuquerque Road), New Delhi. It's not far from Connaught Place. Opening Hours: 10 a.m. to 5 p.m., daily except Mondays. Also closed every second Saturday of the month. Brook Mitchell / Design Pics/Getty Images. An iconic and imposing Kolkata landmark, Victoria Memorial was constructed during the height of British reign in India in memory of Queen Victoria. It's now an extensive fine art history museum with 25 galleries, displaying a collection of 3,900 paintings and more than 28,000 artifacts. The newest gallery, the Calcutta Gallery, details the history and development of the city from the early days of the East India Company up until the transfer of India's capital to Delhi in 1911. Here's what you need to know before you go to Kolkata. Location: Kolkata Maidan, near Jawaharlal Nehru Road. Opening Hours: 10 a.m. to 6 p.m., daily except Mondays and national holidays. Tickets: 30 rupees for Indians. 500 rupees for foreigners. Visiting the Wagah Border, which separates India and Pakistan? Now you can discover more about it and how it came into existence. The 17,000 square foot Partition Museum records and preserves the experiences of those affected by the 1947 Partition of India (which took place as part of India's Independence). Housed in the restored Town Hall, some sections of the museum opened in October 2016, with the full launch taking place on August 17, 2017 (the 70th anniversary of The Partition). One of the highlights is the Gallery of Hope, which tells inspiring stories of people who crossed over to the Indian side with nothing and managed to build successful businesses. Plan your trip to Amritsar with this travel guide. Tickets: Indians 10 rupees. Foreigners 250 rupees. Also Visit: Jallianwala Bagh in Amritsar, a memorial devoted to India's struggle for freedom and the horrific Amritsar Massacre of 1919. The vibrant Heritage Transport Museum opened in late 2013 and showcases the evolution of transport in India. It's a private museum that was conceived by vintage car collector Tarun Thakral, and he's included his collection in the museum's expansive display. Expect to see all kinds of transport such as howdahs, bullock and goat carts, palanquins, vintage scooters, aircraft, boats, trains, and unusual contraptions used in rural India. Fascinating! In addition to the galleries, the museum also has a library, reference center, conference rooms, mini auditorium, souvenir shop, and restaurant spread over its four floors. Location: Bilaspur-Taoru Road (Major District Road 132) off NH 8 (Bilaspur Chowk), Taoru, Gurgaon, Haryana. The museum can be visited on a day trip from Delhi. Opening Hours: 10 a.m. to 7 p.m., daily except Mondays. Tickets: 400 rupees for adults, 200 rupees for children. (The rate is the same for both foreigners and Indians). Free entry for disabled persons and children aged under three. Learn about the history of the Indian Army, and the bravery of its soldiers during the 1965 Indo-Pakistan War and 1971 Battle of Longewala, at the new Jaisalmer War Museum. The museum was conceptualized by Lieutenant General Bobby Mathews and inaugurated in August 2015. It has two large display halls, an audio visual room, souvenir shop, and cafeteria. Up for viewing are numerous war trophies, vintage equipment, tanks, guns and military vehicles. One of the highlights is a Hunter aircraft, used by the Indian Air Force during the Battle of Longewala. Here's what else to see and do in Jaisalmer. Location: The Jaisalmer Military Station, situated not far from Jaisalmer on the Jaisalmer-Jodhpur Highway. Opening Hours: 10 a.m. to 5 p.m., daily. Tickets: Free to enter, although there's a cost for documentary screenings. The Madhya Pradesh Tribal Museum opened in June 2013 as a celebration of the state's tribal culture. Don't expect to find the usual staid collection of artifacts at this inventive museum. What makes it remarkable is that its displays have been created by tribal artists, from the various major tribes of Madhya Pradesh and Chattisgarh, themselves. The engaging and colorful galleries of tribal life, aesthetics, and spirituality are alive with creativity and artistic expression. You'll feel like you've been magically transported to a tribal village. The museum often hosts cultural programs as well. Location: Shyamala Hills, between the State Museum and Indira Gandhi Rashtriya Manav Sangrahalaya Archaeological Museum, Bhopal. Opening Hours: Noon to 7 p.m., daily except Mondays and state holidays. Tickets: 10 rupees for Indians. 100 rupees for foreigners. Free for children under 10 years of age. Photography costs 50 rupees. This vast and well-organized museum is promotes the indigenous and tribal cultures of Northeast India. It's spread over seven floors, with each floor having a different theme. The highlight on the top floor is a Sky Walk with panoramic views across Shillong. There are 17 galleries including agriculture, costumes, food, housing, language, people, religion, and weapons. In addition, a short documentary about Northeast India is screened. The museum also has restaurant that serves traditional indigenous Northeast cuisine. Visit these other tourist destinations in Meghalaya while you're there. Location: Guwahati-Shillong Road, Mawlai, Shillong. Opening Hours: 9.00 a.m. to 5.30 p.m. (until 4.30 p.m. from December 1 to January 31). Closed Sundays and public holidays. Tickets: 100 rupees for Indians. 200 rupees for foreigners. Photography costs 250 rupees (DSLR camera) or 100 rupees (cell phone). Love handicrafts? Don't miss visiting the Living and Learning Design Center for remarkable insight into the lives and culture of artisan communities in Gujarat's Kutch region. Its museum complex was inaugurated in early 2016 and has galleries, a library, and three crafts studios. The exhibits feature a variety of local crafts including textiles, pottery, and metal, wood and stone work. Location: 705 Bhuj-Bhachau Road, Ajrakhpur, Kutch. Opening Hours: Daily except Mondays, from 10 a.m. to 6 p.m.
Tickets: 50 rupees for adults. 20 rupees for children. If you're interested in textiles, the Calico Museum of Textiles is also worth visiting. It has an enormous collection of traditional Indian textiles, some dating back 500 years. The museum was set up in 1949 at Calico Mills, in the heart of Ahmedabad's flourishing textile industry, by industrialist Gautam Sarabha his sister Gira Sarabhai. Later, as the museum's collection expanded and the Sarabhai Foundation took over the management of it, the museum was shifted to its current atmospheric premises in 1983. The ornate chauk features the main galleries, with court textiles of Mughal and provincial rulers from the 15th to 19th centuries, regional embroideries of the 19th century, carpets, costumes, and a display of India's textile trade with the world. 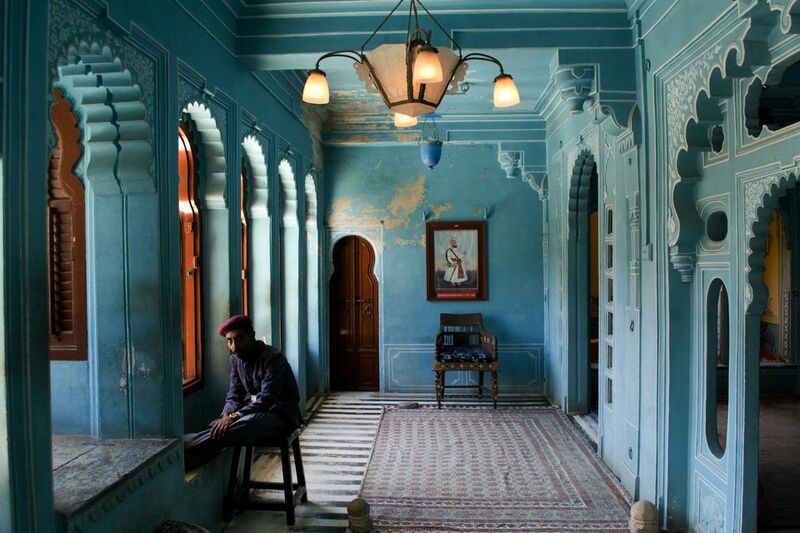 The haveli (old mansion) houses religious textiles with depictions of Indian deities, paintings and sculptures. There's also a gallery of Indian textile techniques, library and museum shop. Location: The Retreat, opposite Underbridge, Shahibag, Ahmedabad. Opening Hours: A two-hour guided tour takes place at 10.30 a.m., daily except Wednesdays and national holidays. The tour is limited to 20 people and you'll need to register in advance (preferably a month beforehand). Do note that children below 10 years of age are not permitted on the tour.